from fruit grown on our two and a half acre vineyard at Coghills Creek. 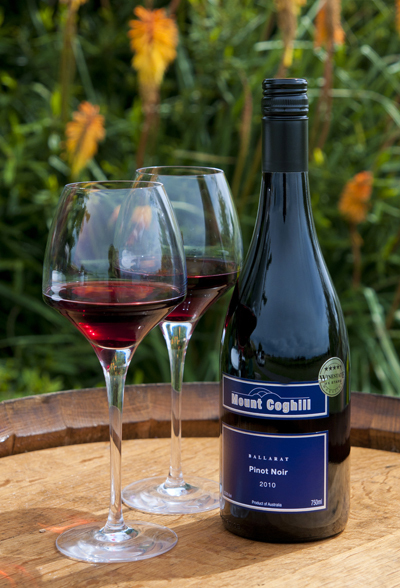 Mt Coghill Vineyard is located 24 km north of Ballarat at Coghills Creek. 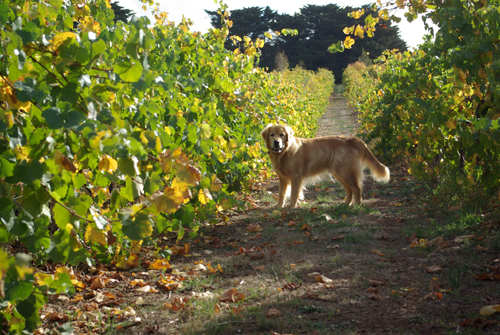 The vineyard is owned and operated by Margaret & Ian Pym. At an altitude of 430 metres above sea level, night time temperatures are very cool, which aids in the retention of natural acidity. The cool climate is ideal for producing high quality Pinot Noir and Chardonnay. The vineyard is planted on red volcanic soil which produces a fruit driven wine. 1500 Pinot Noir rootlings were planted in 1995 and then 450 Chardonnay vines were planted in 1996. The vines are cane pruned and trellised. Vertical shoot positioning is utilised to maximise the fruit exposure to sunlight. Picking is carried out by hand usually at the end of April. Extensive use of bird netting ensures the fruit can be harvested when the flavour profile and balance of acid and sugar levels have reached their optimum levels. Our wines are made at Eastern Peake by our nephew Owen Latta. Click on Gallery to see more pictures of the vineyard and events. and a number of restaurants in the Ballarat region.